"Swampland" redirects here. For the theoretical-physics concept, see Swampland (physics). For other uses, see Swamp (disambiguation). A marsh is a wetland composed mainly of grasses and reeds found near the fringes of lakes and streams, serving as a transitional area between land and aquatic ecosystems. A swamp is a wetland composed of trees and shrubs found along large rivers and lake shores. Swamps are characterized by slow-moving to stagnant waters. Many adjoin rivers or lakes. Swamps are features of areas with very low topographic relief. Historically, humans have drained swamps to provide additional land for agriculture and to reduce the threat of diseases borne by swamp insects and similar animals. [clarification needed] Many swamps have also undergone intensive logging, requiring the construction of drainage ditches and canals. These ditches and canals contributed to drainage and, along the coast, allowed salt water to intrude, converting swamps to marsh or even to open water. Large areas of swamp were therefore lost or degraded. Louisiana provides a classic example of wetland loss from these combined factors. Europe has probably lost nearly half its wetlands. New Zealand lost 90 percent of its wetlands over a period of 150 years. Ecologists recognise that swamps provide valuable ecological services including flood control, fish production, water purification, carbon storage, and wildlife habitat. In many parts of the world authorities protect swamps. In parts of Europe and North America, swamp restoration projects are becoming widespread. Often the simplest steps to restoring swamps involve plugging drainage ditches and removing levees. Swamps and other wetlands have traditionally held a very low property value compared to fields, prairies, or woodlands. They have a reputation for being unproductive land that cannot easily be utilized for human activities, other than perhaps hunting and trapping. Farmers, for example, typically drained swamps next to their fields so as to gain more land usable for planting crops. Many societies now realize that swamps are critically important to providing fresh water and oxygen to all life, and that they are often breeding grounds for a wide variety of species. Indeed, floodplain swamps are extremely important in fish production. Government environmental agencies (such as the United States Environmental Protection Agency) are taking steps to protect and preserve swamps and other wetlands. In Europe, major effort is being invested in the restoration of swamp forests along rivers. Conservationists work to preserve swamps such as those in northwest Indiana in the United States Midwest that were preserved as part of the Indiana Dunes. The problem of invasive species has also been put into greater light such as in places like the Everglades. Swamps can be found on all continents except Antarctica. The largest swamp in the world is the Amazon River floodplain, which is particularly significant for its large number of fish and tree species. The Sudd and the Okavango Delta are Africa's best known marshland areas. The Bangweulu Floodplains make up Africa's largest swamp. The Tigris-Euphrates river system is a large swamp and river system in southern Iraq, traditionally inhabited in part by the Marsh Arabs. In Asia, tropical peat swamps are located in mainland East Asia and Southeast Asia. In Southeast Asia, peatlands are mainly found in low altitude coastal and sub-coastal areas and extend inland for distance more than 100 km (62 mi) along river valleys and across watersheds. They are mostly to be found on the coasts of East Sumatra, Kalimantan (Central, East, South and West Kalimantan provinces), West Papua, Papua New Guinea, Brunei, Peninsular Malaya, Sabah, Sarawak, Southeast Thailand, and the Philippines (Riley et al.,1996). Indonesia has the largest area of tropical peatland. Of the total 440,000 km2 (170,000 sq mi) tropical peat swamp, about 210,000 km2 (81,000 sq mi) are located in Indonesia (Page, 2001; Wahyunto, 2006). The Vasyugan Swamp is a large swamp in the western Siberia area of the Russian Federation. This is one of the largest swamps in the world, covering an area larger than Switzerland. The Atchafalaya Swamp at the lower end of the Mississippi River is the largest swamp in the United States. It is an important example of southern cypress swamp but it has been greatly altered by logging, drainage and levee construction. 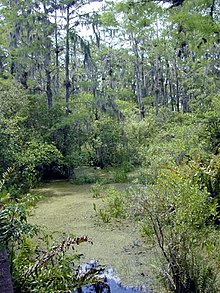 Other famous swamps in the United States are the forested portions of the Everglades, Okefenokee Swamp, Barley Barber Swamp, Great Cypress Swamp and the Great Dismal Swamp. The Okefenokee is located in extreme southeastern Georgia and extends slightly into northeastern Florida. The Great Cypress Swamp is mostly in Delaware but extends into Maryland on the Delmarva Peninsula. Point Lookout State Park on the southern tip of Maryland contains a large amount of swamps and marshes. The Great Dismal Swamp lies in extreme southeastern Virginia and extreme northeastern North Carolina. Both are National Wildlife Refuges. 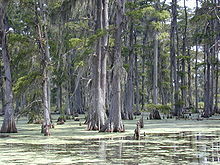 Another swamp area, Reelfoot Lake of extreme western Tennessee and Kentucky, was created by the 1811–12 New Madrid earthquakes. Caddo Lake, the Great Dismal and Reelfoot are swamps that are centered at large lakes. Swamps are often called bayous in the southeastern United States, especially in the Gulf Coast region. The world's largest wetlands include significant areas of swamp, such as in the Amazon and Congo River basins. Further north, however, the largest wetlands are bogs. ^ a b c Hughes, F.M.R. (ed.). 2003. The Flooded Forest: Guidance for policy makers and river managers in Europe on the restoration of floodplain forests. FLOBAR2, Department of Geography, University of Cambridge, Cambridge, UK. 96 p.
^ Wilcox, D.A, Thompson, T.A., Booth, R.K. and Nicholas, J.R. 2007. Lake-level variability and water availability in the Great Lakes. USGS Circular 1311. 25 p.
^ Keddy, P.A., L.H. Fraser, A.I. Solomeshch, W.J. Junk, D.R. Campbell, M.T.K. Arroyo and C.J.R. Alho. 2009. Wet and wonderful: the world's largest wetlands are conservation priorities. BioScience 59: 39–51. ^ a b Dugan, P. (ed.) 2005. 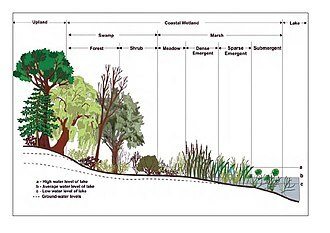 Guide to Wetlands. Buffalo, New York. Firefly Books. 304 p.
^ Keddy, P.A. 2010. Wetland Ecology: Principles and Conservation (2nd edition). Cambridge University Press, Cambridge, UK. 497 p. Chapter 11. ^ Keddy, P.A. 2010. Wetland Ecology: Principles and Conservation (2nd edition). Cambridge University Press, Cambridge, UK. 497 p. Chapter 13. ^ Hunter, Malcolm L. (1999). Maintaining Biodiversity in Forest Ecosystems. Cambridge University Press. p. 325. ISBN 978-0521637688. ^ a b L.H. Fraser and P.A. Keddy (eds.). 2005. The World's Largest Wetlands: Ecology and Conservation. Cambridge University Press, Cambridge, UK. 488 p.
^ a b Brennan, Zoe (2006-06-24). "The superlions marooned on an island". The Daily Mail. Retrieved 2018-04-18. ^ a b Main, Douglas (2013-11-26). "Photos: The Biggest Lions on Earth". Live Science. Retrieved 2018-04-18. ^ a b "Lions of the Okavango". Siyabona Africa. Retrieved 2018-04-18. ^ Daoudy, Marwa (2005). Le Partage des Eaux entre la Syrie, l'Irak et la Turquie (in French). CNRS. pp. 1–269. ISBN 2-271-06290-X. Retrieved 2016-04-06. ^ Conner, W. H. and Buford, M. A. (1998). Southern deepwater swamps. In Southern Forested Wetlands: Ecology and Management, eds. M. G. Messina and W. H. Conner, pp. 261–87. Boca Raton, FL: Lewis Publishers. ^ Reuss, M. (1998). Designing the Bayous: The Control of Water in the Atchafalaya Basin 1800–1995. Alexandria, VA: U.S. Army Corps of Engineers Office of History. ^ "India wild tiger census shows population rise". BBC News. 28 March 2011. Retrieved 2011-02-08. ^ Nowell, K.; Jackson, P., eds. (1996). "Panthera Onca". Wild Cats. Status Survey and Conservation Action Plan (PDF). Gland, Switzerland: IUCN/SSC Cat Specialist Group. IUCN. pp. 118–302. Retrieved 2015-09-07. Wikimedia Commons has media related to Swamps. "Swamp" . New International Encyclopedia. 1905.